For most areas touched by the mid-August floods, the waters have receded and people have been getting on with their lives. I've seen people attempting to replant rice, even though there's no security that they will have enough water to last until harvest. Usually the rains stop by early October, then the rice dries out enough for cutting over the next few weeks. Most people start harvesting mid-October through end of November. The local variety of rice grows over a 4 month long period. 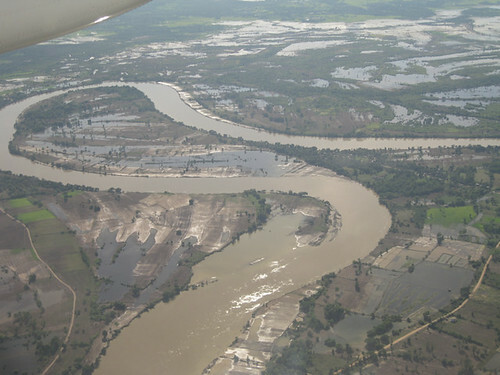 I flew back from Xieng Khouang and saw the flooded areas around the Nam Ngum area. Rains in the mountains flow into the reservoir and it was at a dangerous level in mid-August so they had to release water. 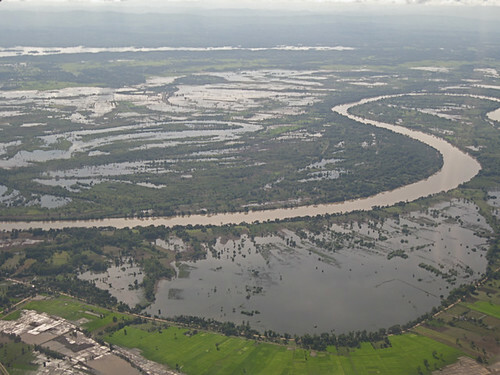 Along with the water backing up from the Mekong, the whole area along the Nam Ngum flooded. The Lao government responded quickly, with negotiations with Thailand for sand and donations of sandbags, as well as providing food, water and lodging for people displaced by the floods. There still is a lot of cleanup and repair to do now, as well as trying to prevent this from happening in the future. Thanks for share your local report.